The Wood-Burning Fireplace. Energy Efficient? The image of a fireplace is popularly associated with the warm, cozy feeling of a home. But does a fireplace provide enough heat to keep out the chill of, say, a New England winter? If that’s where you are, it would be worthwhile to contact a HVAC contractor in Baltimore. Is a fireplace an economical, efficient way to heat a home? In addition to providing inadequate, inefficient heating, traditional fireplaces can constitute a health hazard. Particles from wood smoke penetrate deeply into the lungs, causing serious, long-term health problems, particularly in young children, the elderly, pregnant women, people who smoke and people with respiratory diseases. Wood smoke also contains known carcinogens. Here are several components that can make fireplaces more efficient. Before making a decision, always consult a professional HVAC contractor in order to find the most efficient and safest alternative for your home. Dampers. A damper is a metal plate, often made of cast iron, that regulates air flow through the chimney. Where the fireplace is used often, the damper should be inspected every year in order to make sure that it closes as tightly as possible, since dampers can warp over time due to their exposure to high heat. A firebox of the proper size. A firebox must match the size of the fire that we build – which is usually a good deal smaller than a conventional open fireplace. Fireplace doors. These can be made of tempered glass, which is less expensive but may break more easily in the heat, or ceramic glass, which is more durable but costly. The most efficient combination is ceramic glass doors together with a “glass airwash” system in which preheated air is released through a narrow slot just above and behind the glass. The door should have gaskets so that it will seal as tightly as possible. A combustion air control. This allows you to adjust the speed at which the fuel burns. Any fireplace with such a control must also have a combustion system that will convert the smoke released from the fuel into usable heat. 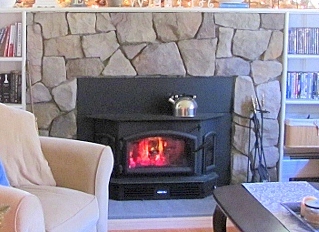 Wood-burning inserts or wood stoves. Today’s wood-burning inserts are much more efficient. Choose an EPA-approved model and make sure that you have a full stainless-steel liner installed on top of the chimney. Although the liner is expensive, it will keep costs down and efficiency up over the long term. Electric fireplaces can be used as decoration or as room heaters. Thanks to recent technology, some electric fireplaces look almost like the real thing – but if they are installed, the fireplace can no longer be used to burn fuel. Masonry heaters. These freestanding units, which take a long time to heat, burn wood at much hotter temperatures. This reduces emissions and allows the heater to give off heat more steadily over a longer period of time. If you are considering adding a fireplace to your home, contact a HVAC contractor. Also, a remodeling contractor can help you plan the design and installation of a fireplace for your home.